Big B Amitabh Bachchan's Television Game Show on Sony TV Kick Started and Some of the Prticipants have been Selected after the Registration process. Millions of People have applied for the KBC 9 Game Show and Some of them have been Selected. If you are not Selected, Don't Get Disappointed, Here's One more Chance for you. Answer the Jio Ghar Baithe Jeeto Jackpot Question and get a Chance to be Part of the Show and Earn One Lakh for Each Day. 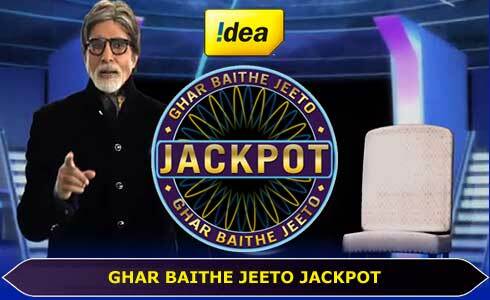 Any One Can Participate in Jio Ghar Baitho Aur Jeeto Jackpot Contest. You Just Have to Have the Jio Mobile Device to be Part of It. Answer the Simple Question and Win an Amazing Prizes. Here is the Step by Step Instructions you Should Follow to Answer the Question of Ghar Baithe Jeeto Jackpot Questions. It is a free of cost service as Jio doesn’t charge anything for sending sms. You Can Answer the Questions of KBC 9 Jio Ghar Baitho Jeeto Questions Asked by Big B Amitabh Bachchan and get a Chance to Win the Datsun RediGo Car each day. Answers of the GBJJ (Ghar Bhaithe Jeetho Jackpot) questions to be answered in a way mentioned Above. All the Best All the KBC 9 Jio Ghar Baithe Jeeto Jackpot Players. Keep Watching KBC 9 Every Monday to Friday 9 PM on Sony TV. Ask in Comments if you have Any Questions Regarding Jio Ghar Baithe Jeeto Jackpot Contest. What is the time limit to answer the last question? Sir message send kar ne ki koisis kar rahaa hai par send hi nahi ho raha .when i send messange he said failed. Today answer is KBC C VARUN DHAWAN. Bhai mera question delivered hi nahi ho raha hai,any solution?? Mai sms send kr raha hu to mujhe failed sms msg aa rahe hai....2 din pahle tak msg ja rahe the par ab nahi ja rahe hai.. plz suggest me..